So it was live. So what? I get that it’s a lot of pressure, but what value does it add? The only appeal is that some audience members watch purely in the hopes that a wheel will fall off the wagon. It’s cheating, sort of. My Favorite Things is most definitely, absolutely, positively not sung by Mother Superior in the Abbey! Somehow in this version Maria leads Mother Superior in singing, when we all know that the song belongs in the storm scene when the children all climb into bed with Maria. As a corollary to above point, WTF with the yodeling during the storm scene? I will begrudgingly admit that I enjoyed the choreography and the children sticking their adorable little heads out from under the bed. But they are supposed to be singing My Favorite Things! I want to know who’s responsible for cutting the whole yodeling marionette scene. Bad idea, genius. Bad. Idea. Here it is for those of you longing for it as much as I was. Is it because Maria is suddenly a blonde that The Baroness has to be a brunette? Because we all know that The Baroness should be blonde. Duuuh. Missing gazebo. What is the point of Sixteen Going On Seventeen if they’re not dancing inside a gazebo? Come to think of it, the whole set was awful. I’ve seen better sets in elementary school Christmas pageants. The mountain? Styrofoam trees? Why are they in the woods? Having been to the real Salzburg and the real Alps, this is a travesty. Plot twists? Are you kidding me? The plot was just fine in the original thank you very much. Now suddenly The Captain and The Baroness broke up over political differences? I’m not saying that The Baroness might not have marched right into the arms of the waiting Nazis, what I’m saying is that we don’t want to see that in a musical. If we did want to see it in a musical, then we would watch The Producers and enjoy that classic tune, Springtime for Hitler. Might I suggest that for NBC’s next “special”? Needless to say, I am devastated. I’m just going to pull the covers over my head and try to put the shattered fragments of my life back together. This entry was posted in Uncategorized and tagged Celebrity, Culture, Family, Irreverent, Music, Television, Travel. Bookmark the permalink. I’m going to stick my neck out here and admit that I didn’t watch it. I was too afraid that Stephen Moyer (Captain Von Trapp) would turn into a vampire (like on True Blood) and attack the rest of the cast. Since the production was live they wouldn’t be able to edit out the icky parts. Sounds like the production was a little icky anyway – even without the undead thing. Based on the commentary, it sounds like that might have been an accurate description. I totally give Carrie Underwood, a very talented country ala pop music singer, credit for having the courage to play Maria; sadly, she’s no actress. The other actors did a fabulous job, but try as I may to watch the program in it’s entirety, I had to continually change the channel, back and forth, because it hurt too much to watch at certain points. I was driven to search for the original movie “The Sound of Music” on Netflix (don’t waste your time; they don’t have it). For those of us raised on the musical production/movie “The Sound of Music” annually for at least 40 years, it was hard to watch. I had to constantly remind myself that “change is good, change is good”. It was like a train wreck-I couldn’t look–but I couldn’t look away. Sigh. I totally missed it but my friend loved it and she is such a fan of the original. She thought Carrie did a great job. Of course we were discussing this at a bar which by the way did not appreciate our rendition of Favorite Things. Couldn’t figure that one out. You captured my thoughts exactly! As soon as they started doing the yodeling song in the bedroom during the storm, I was out. Couldn’t deal. I understand that it was a performance of the Broadway production and not of the film adaptation, but seeing as most of the world knows the film better, I would think they would try that version instead! Carrie is a wonderful vocalist. But she is not an actress. For what it was, it was ok….but I’ll stick with the film. Oh – and the highlight – Audra McDonald as Mother Superior. Her voice is stunning! Right is right and wrong is wrong. In the name of all that is sacred in this world, there should not be yodeling in Maria’s bedroom! Dear Friend, Get a grip 🙂 I watched the entire show and staying up until 11:00 on a work day is unheard of. I really enjoyed enjoyed it but I’m a Carrie Underwood fan. 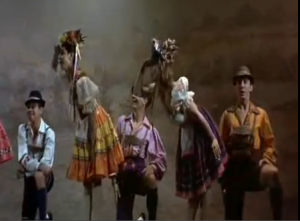 Here’s a better link to Springtime for Hitler; http://www.dailymotion.com/video/x15bf3_spring-time-for-hitler_fun and don’t you all take Jill too seriously now. Sure we all read this was a ballsy move to revive live theatrical broadcast, but isn’t it more likely the last gasp of primetime network tv, as we all paused and timeshifted their live broadcast or sampled it on our minitablets and maxiphones? Thanks for coming to my defense Cousin Dan! Please read this in a whisper – I didn’t watch it. Damn…I fought the law, and the law won. Actually, this was based on an adaptation of the original Broadway musical and not the movie. I watched it too and thought they did a good job. It’s something tv had not done in 50 years. A real live performance and not some pre-taped show. Give the performers some credit for that as it must not have been easy knowing that any mistep or flub could not be corrected. Was it perfect? Hell no. Still, it wasn’t as bad as some sitcoms on tv now.